So you want to make money in the stock market? The best way to start out is to educate yourself about investing, and the most favorable way to do this is to partake of free investment and trading resources from the best online brokers around. I wholeheartedly believe that knowledge is power. Personal beliefs: The stock market is for gamblers! Complicated behaviors: I’m having too much fun trading my bucks away. Buy high, sell low. Lack of experience and information: Why bother learning? There are pros for this sort of thing! Interest: The stock market is for geeks. Too boring for me. So given all these tendencies, what kind of results does the average investor yield? The average investor earned 3.9% a year, before taxes! Inflation grew 3.0% a year. The S&P 500 ($INX) earned 11.9% a year. 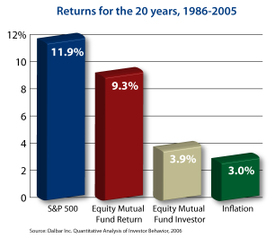 The average equity mutual fund returned 9.3% a year. These points are representative of the information provided by The Skilled Investor, who wrote about a formal study made from 1991 through 1997 that showed that most individual investors handled their investments poorly. Interestingly, these seem to mirror the casual, empirical data I’ve previously gathered. On average, the portfolios of investors in this study held four stocks in 1991 and seven in 1997. About 25% of accounts held only one stock, and about half held one or two stocks. On a risk-adjusted basis, this lack of diversification was quite costly to these investors. When compared to the broad market portfolio, 80% to 90% of these investors’ portfolios underperformed the market over the period of the study. Assumptions: Over two-thirds of the survey respondents (69%) admitted to being at least “somewhat knowledgeable” about investing with only 12% believing they were “not at all knowledgeable.” 60% owned stocks and 60% claimed they owned mutual funds. Almost half of the respondents believed that stocks are insured against losses. 70% of the survey respondents did not understand that when one buys stock on “margin,” he or she can lose ALL of the investment, even if the value of the shares does not go to zero. 80% did not know the definition of a “no load” mutual fund. The survey also suggested that many investors do not know the difference between loads (sales charges) and normal operating expenses of mutual funds. 60% did not understand that if interest rates rise, most bonds lose money. Almost 70% of the survey respondents did not understand why municipal bonds offer lower pre-tax yields. 21% replied that they expected annual returns of 15%-25% from a broadly diversified U.S. stock mutual fund over the long run. 49% of respondents did not know that stocks produced higher average returns than most other investments over the long term. 28% did not understand the link between investment performance and risk. 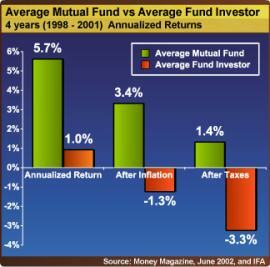 What’s quite telling here is how the average investor actually underperforms the average mutual fund, most likely because of the investor’s common behavior of switching from one fund to another, chasing returns while buying high and selling low. If instead we stay put with a given investment, we’d be tracking that investment’s performance and perhaps have a better chance of matching benchmark returns. Given the kind of showing we’ve seen in the knowledge test, I suppose it’s easy to understand why the average investor holds a portfolio that has returned 3.9% over the last 20 years or so. So why are most people unable to make money in the markets? I’ll boil it down to a few reasons: lack of information, inexperience and arrogance. The stock market can eat you alive when you haven’t studied it enough and you decide to jump in without much understanding. The stock market may also humble you if you think you’re way too smart for it and decide to embark on the quest to beat it year after year. I’ve decided I’d like to make money in the markets with the least amount of work possible, and a diversified portfolio of index funds should do the trick. No rocket science here, but unfortunately, too many of my buddies just don’t buy it. I would include greed as another one. This played out during the tech boom when people reassessed their portfolios and moved their allocation to high flying stock picks throwing out any tried conventional wisdom out the window for 20 to 30 percent yearly gains. We have also seen this with housing and finance during this decade with REITs and finance stocks littering many a retirement portfolio. Like you say, some don’t take an active interest in managing their finances. Many think that simply leaving money in their 401(K) is enough to combat the current market and preserve their wealth. This isn’t the case. I agree that people shouldn’t day trade but I think the days of buy and hold are completely gone simply because we are in a different environment. Never had we had such high debt levels and a country with no manufacturing base. Also, if we go back to the 1929 peak, the DOW didn’t recover for 25 years. So it also depends during which time in history we are looking at. With the investment spectrum, you’ve got the amateur traders on one end and the buy and holders on the other hand. You are right that either case can be considered “extreme”. I wouldn’t advocate the straight up buy and hold approach in the same way I wouldn’t deal with emotional market timing. What I’ve been doing instead: asset allocation, evaluating the portfolio along with asset rebalancing methods. Doing so has protected our portfolio well during tougher market climates and has benefited handily from stronger years and market run ups. Wow. Those statistics are horrifying. Seriously horrifying. I hope more companies move to the automatic enrollment model for 401(k)s where a small portion of salary is put into a target fund unless the employee actively opts out. This will (1) help people who wouldn’t have done anything to save something for retirement and (2) prevent people from chasing performance. I wouldn’t call myself a particularly compassionate person, but I really worry what will happen to current workers when they retire and there’s nothing to live on! You’re exactly right about the danger zones of too much information and too little information. People need to realize that they’re not too dumb to understand the basics of investing. It takes little time and effort to pick an appropriate allocation, even if you ultimately go with a target-dated or lifestyle fund. They also need to realize that they’re not experts. They don’t talk to CEOs on a regular basis. They don’t have (for the most part) a team of research analysts combing through financials for them. They need to dedicate themselves to carefully researching stocks, or stay out of the individual stock game altogether. What I think is the worst is people not understanding how loads and commissions and such work. That’s be a good public education project. Although it may seem that it personal finance and investing isn’t rocket science, the truth is, it takes people some level of education and experience to hit that magic point that makes them truly comfortable with what they are doing. Or at least, that’s what happened to me. It took a lot of trial and error. Also, around 75% of the people I know really aren’t big on finance and find it one of the dullest subjects on earth. I am often criticized or teased for taking such a strong interest and stance on the subject, being as it may, one of my most favorite hobbies. But it sure has helped me do much better with investments! Since we don’t receive a formal personal finance education (particularly in investing) through our schools, we unfortunately are left to our own devices to “figure things out”. Anyway, I agree that it doesn’t take much for one to go the easy route and pick a target or lifestyle fund to get invested. Stock Market is like Las Vegas. Is hard to win. My thoughts are a little different over here. you have mentioned the performance of mutual funds but what about direct equity. When you are into investing, investing in mutual funds is for the ignorant. The very fact that you are invested in mutual funds says that you do not have knowledge about stock market and you are dependent on the decisions of a fund manager. Marketing Deviant and The Chef, it’s pretty interesting how your comments reflect a complete juxtaposition in opinion here. @MD: the main thing to accept about the stock market is that it entails risk to participate in it. However, the odds are in your favor if you do decide to invest in it, *provided* you understand your risks and control it accordingly. In that sense it is not the same as Las Vegas. I’ve tried gambling to some extent and I’m known to be terribly unlucky at it, so I’ve since avoided casinos. However, so far, in 2 decades of investing, I’ve been pretty much fairly “well-invested” in the stock market and would consider myself a successful investor. @The Chef: Very interesting how you say that “investing in mutual funds is for the ignorant” and that “I don’t know the stock market and am dependent on the decisions of a fund manager.” On the contrary, I do all the decisions on my own as I am responsible for my own diversification strategies, investment composition and portfolio allocation. I also use index funds (no fund managers there) as a core investment and do a lot more to hedge the assets I have. With all due respect, you kinda sound like some young people I know who work in high finance (I have a few in my family). They only like to trade and study stocks all day (well I guess that’s their job). But give it a few years and even they will realize there may be a better way to do well in the stock market. If you are not investing in a balanced risk management pardigm you are losing (even if your stock or funds are rising, you’d be missing gains you should have). There was a great report on the psychology of investing and risk in Fortune. It basically said you need to try as much as possible to take emotion out of the mix. Too worried your friends are doing better, you will probably buy high. Still not sure this whole internet isn’t a fad…you are missing out on gains. Thanks, great post and information! This is definitely something I want to break into. Stocks are pretty intense for a novice, but I am committing myself to learning what I can about it. Thanks for the kind words on my blog! Unfortunately it seems to come down to people not really caring. If people have made up their minds that personal finance is boring and dull, you may have a hard time convincing them otherwise. It’s a shame we can’t get through to more people, but at least we are trying. Sometimes I just wonder why we just don’t buy EFT’s and let the indexes do their magic instead of trying to beat them. All investors (including me) think that they will average more than 10% a year and probably aim for 20%. By being too greedy, you lose most of your time and money in stupid transactions…. I like your conclusion, lack of and over information, being the primary reasons. Every boom creates a new set of people who think they have just found the magic formula and the inevitable bust will see almost all of them disappear and a complete new set will rise for the boom after that. As for the overinformed, I suppose all the big banks can be paraded as examples. Emotions and being unable to keep them in check kills a lot of investors. Selling out when the market is down huge, and then being out of the market on the way up. It happens to a lot of individual investors. Excellent post! Thanks for sharing it. I plan to include your article in my weekly carnival review this Friday. Right on! Most people should put their investment money in a low cost index fund! I’ve consistently beaten the averages for 12 years; but, it has taken a lot of work. Unless you want to spend 10+ hours a week, read a lot of books, learn how to evaluate financial statements, phone in for shareholder meetings and are disciplined enough to remove emotion from your trading strategy, invest in a low cost broad market index fund and make some decent money with very little effort. Never tried myself investing on a stock market and if I ever I will I must take note on the things you have mentioned. Like for personal beliefs, complicated behaviors, interest, and lack of experience and information. The latter, I really need to read more books consult an expert just like All About the Ben has said. Just like when you are experiencing debt problems we too find someone who can help us on debt settlement also. I think that to really make a lot of money in the stock market you really have to like it and simply love to follow it and be part of it. If you are in there just because you want to make money and your interest is elsewhere, just open a CD. It takes lots of energy, emotional stability, and capital at hand at risk to make decent amounts of money. I trade options and I love it and I do make money. Yes I do have my own bad days that make me cringe at times but I love it. Others must too in order to make money. It’s the same like in any business — you need to work to get money. It’s just easier to succeed if you love what you do. In the stock market, you have to have a lot of knowledge and remove all emotions from your decision. The most frightening thing is that the market is full of ignorant investors who are confident of themselves. The wise investors are full of doubt, but the less informed are very sure of themselves. From my experience, one cannot consistently make money with short term trading. The market is not confidential and in my view, it needs to be, in order to be both legal and to allow cause and effect to prevail. For some reason, an investor is allowed to own enough shares such that they can move the share price any direction they choose….. this means that when you enter the market, “they” can go for your stop-loss (if you have set one) or can put you into margin-call territory, generally because the market is configured in this seemingly illegal way. 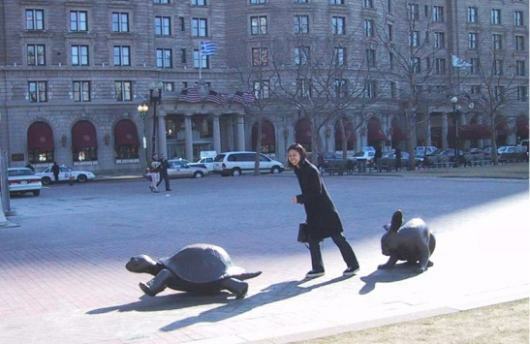 You will be run ragged if you day trade. If every trader could enter and exit the market confidentially, then it would NEVER be so volatile. Volatility is sheer manipulation by those with an illegal advantage who are trying to rip off retail or middle of the road traders. Beware!